SOFTlab design studio has created a stained glass-inspired installation for behance's new office. The work comprises of the brand palettes of behance and parent company Adobe where multilevel installation dominates the internal stairwell. The two floors of the behance office space is been connected with their interior design. The visual transition of blue and red of the two brands collide from one side of the place to another. 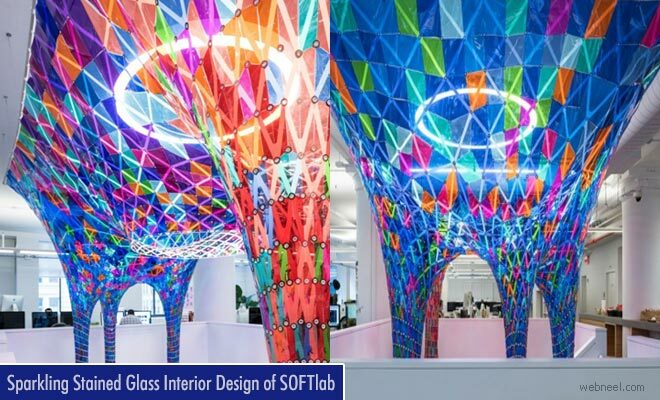 The pre-dominantly white office space is covered with colour panels of vibrant hues accross reflecting the interior designing skills of SOFTlab. The interior design somewhat resembles three-dimentional stained glass window that casts coloured light throughout the space.